The elbow joint is a type of hinge joint. It bends (flexion) and straightens (extension), as well as rotating to position your palm up or down. The normal range of flexion and extension is from 0 to 145 degrees, although the range of motion that we work within for daily activities is only from 30 to 130 degrees. This means that for most people a bit of loss of motion does not cause problems with function. However, with a reduction of extension greater than 30 degrees and or a flexion less than 130 degrees most people will complain of loss of function. 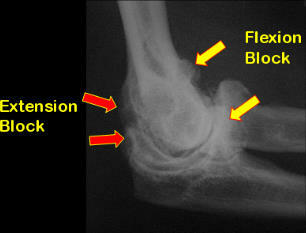 Loss of extension is usually less disabling than loss of same degree of flexion. Factors that cause stiffness are divided into those that are within the elbow joint itself (intrinsic) and those in the tissues around the joint, such as the muscles and tendons (extrinsic). The commonest cause of stiffness is after trauma and injury. In fact, some stiffness after an elbow injury is very common. Usually this improves, but sometimes it may not. The amount of stiffness isdirectly related to the degree of initial trauma and the degree of involvement of the joint surfaces is most important. The length of immobilisation after injury also leads to more long-term stiffness. The aim is to give the patient pain-free, functional and stable elbow. This means 30-130 degrees flexion and 100 degrees of rotation. Physiotherapy involves active motion exercises. Ideally this should be with a physiotherapist who has an interest in upper limb rehabilitation. Close consultation with your surgeon is recommended. Passive stretch (someone else pushing or pulling on your elbow) should be avoided in most cases. Splinting may have a role in some cases under the direction of your surgeon but in most cases should be avoided. Surgery is indicated when patients are no longer improving in their original posttraumatic rehabilitation program. At least 6 to 9 months should be allowed for the inflammatory phase of soft tissue healing to resolve. This may be performed via keyhole (arthroscopy) or open surgery. The decision depends on the surgeon’s experience and the type of stiffness. Arthroscopic release is ideal for stiffness due to arthritis and when there has been no previous surgery. However, if there has been a previous internal fixation and there are extrinsic causes for the stiffness open surgery is required.